Those of you who have read my previous blog post 10 Reasons Why Research Scientists Should Patent Search know that I use patents to find information about my research topics. One of the most valuable resources I had when I first started researching patents was a lengthy (and rather technical) introduction to the way they work. 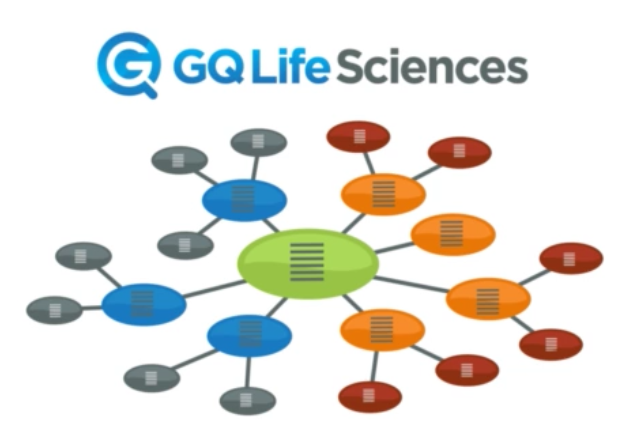 At GQ Life Sciences, we all believe that everyone should have easy access to patent data. In that spirit, I’ve summarized three of the most important elements to help you access patent information as efficiently as possible. 1) Know about the patent life cycle. You have to understand that most applications for patents are never granted! When you search a patent database, you’ll be searching both granted patents and the large number of patent applications that are in process. Once granted by the patent office – where its legal status will become “grant” – it has a roughly 20 year lifespan of protection, after which the legal status becomes “lapsed.” The 20 year term period starts at the priority date, the date the invention was made. Knowing this basic lifecycle can help you determine a lot about the invention being described and its potential impact on your own patent research. Pro tip: find the most relevant patents by searching only for those documents where the legal status is “grant” or where it is “application” and the publication date is within the past five years. 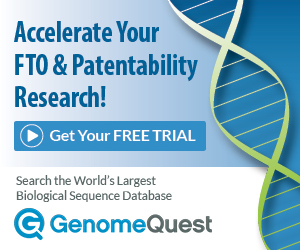 Learn how GenomeQuest provides the most comprehensive access to Patent Data! Most applications and patents come in families, a group of patents that are related to each other by a priority date. Take for example the same application filed in multiple countries through WIPO (World Intellectual Property Organization). WIPO doesn’t grant patents, but they will give an opinion on how potentially patentable an invention is. They also give you a priority date, so that if you later decide to file the patent application in one of their 145 member states you get to use that date as the date the invention was made. Taking this route avoids the costs and troubles of filing in lots of different countries/languages right away and still gives you lots of options to protect your invention if it turns out to be valuable later on. Because these WIPO applications all share the same priority date, they end up in a patent family together. Another way in which US applications can end up in a family together is if they are somehow derived from an earlier application and claim the priority date of that earlier application. This can happen when new claims are added for the same invention (continuation), when the invention has been improved by the same inventor (continuation-in-part), or when an existing application is split into smaller parts (divisional). See more complete explanations of these concepts. When claims from different applications are mixed into a new application like this, the document can end up with multiple priority dates. There are two main types of patent families. The first one, often called a “main,” “simple,” “tight,” or “basic” family, is where all documents in the family have the exact same set of priority dates. These are typically the exact same application in different countries. The second one, often called the “extended” family, is where every document shares at least one priority date with at least one of the other documents in the family. These extended families include all the US derivative patents explained above, and can grow much bigger. Pro tip: use patent families to avoid reading the same document issued in different patent authorities. Instead, pick the single representative document of that family that matters most to your patent research, based on its date, its country, its completeness, or its native language. Also, use patent families to keep track of how a specific invention progresses after the first application has been filed. 3) Pick your search strategy well. With an estimated 80 to 100 million patents out there, it is essential that you pick the right strategy to go through them. You have to find the right keywords to search with first. Unlike scientific articles, inventors often willingly make their patents hard to find by avoiding the usual keywords associated with their domain! They often resort to vaguely describing things instead of outright naming them. In addition, the vocabulary associated with a technology often changes as a research field progresses over time. To find these things you have to cast a wide net first by trying different keyword combinations, using synonym lists, and scanning some of the returned documents to find more and better keywords. Once you’re satisfied with the search results, it’s time to narrow them down by removing all documents that you aren’t interested in. If you have a lot of results, you can try filtering on specific fields like title or abstract. If one of these contain your keywords the documents are almost guaranteed to be interesting to you. You can also filter by publication date to see only the most recent documents. Most professional searchers I know will even go through a long list of documents one at a time and see why they picked it up. Good software for result analysis with a user interface designed for this task will help tremendously. Be mindful where you search. In this day and age it’s relatively easy to find patent search services online. Just know that not all of them are easy to use, and that none of them are very complete. For example, the USPTO site is notoriously user unfriendly and their full text archive is only US and doesn’t go further back than 1976. Google patents doesn’t allow you to search in specific fields like title, abstract, claims, or dates. It also has holes in its data. Especially recent documents are not always available immediately. Pro tip: the one field where inventors have to be specific about their invention is the “Claims” field. It’s the place where they specifically itemize the various components of the invention that they are trying to protect. Make sure you focus key elements of your search on that field. 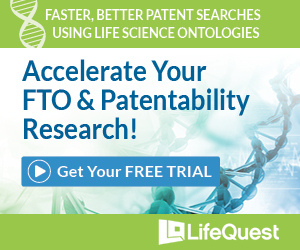 Try LifeQuest or GenomeQuest Today!